(Nanowerk Spotlight) Nanotechnology enabled synthetic biology could one day lead to an artificial construct that operates like a living cell. That day might be a considerable distance off, given the difficulties scientists are still having in even understandiing the organizing principles and workings of a cell, not to mention being able to duplicate cell components and assembling them into a working whole. The large discrepancy between the functional density (i.e., the number of components or interconnection of components per unit volume) of cells and engineered systems highlights the inherent challenges posed by such a task. Just take 'simple' bacteria like Escherichia coli (which has an approx. 2 square micrometer cross-sectional area). The E. coli cell has some 4.6-million base-pair chromosome (the equivalent of a 9.2 megabit memory) that codes for as many as 4,300 different polypeptides under the inducible control of several hundred different promoters (example quoted from Nano-enabled synthetic biology). The most advanced silicon chips will be able in a few years time to come close to this performance (on the other hand, you have several trillion E. coli in your gut; you would need to swallow a lot of computer chips to match this combined 'computing' power). Another way to look at the synthetic cell challenge is to regard the cellular environment as a highly complex synthetic medium, in which numerous multistep reactions take place simultaneously with an efficiency and specificity that scientists are not capable of duplicating at this scale. Researchers in The Netherlands have now succeeded in constructing nanoreactors that can be used to perform one-pot multistep reactions - another step towards the goal of artificial cell-like devices, but more promising in the short term for screening and diagnostic applications. "Nature employs several approaches to ensure the integrity of the – mostly enzyme-catalyzed – synthetic pathways within a cell, one of the most important ones being compartmentalization" Dr. Jan C.M. van Hest explains to Nanowerk. "This approach, which isolates the catalytic cycle, prevents interference by other compounds and enables regulation of the flux of molecules in and out of the microenvironment. Furthermore, to be efficient the biomolecular catalysts need not only to be separated but also positioned at specific sites within the cell." Van Hest, a Professor in the Department of Organic Chemistry at Radboud University in Nijmegen, The Netherlands, together with the groups of Dr. Alan E. Rowan and Dr. Roeland J.M. Nolte, have shown that they can create well-defined assemblies of enzymes that can communicate with each other. With these assemblies, the scientists combined two principles which nature is using for optimal control over synthetic processes, namely protection from environmental influences by compartmentalization, and positional assembly, which brings different catalytic sites in close proximity of each other, without the problem of negative interference. 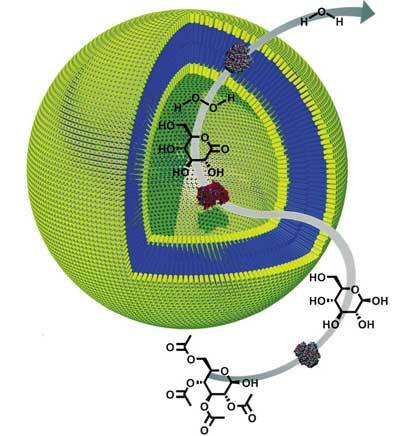 The results have been reported in a paper in the August 17, 2007 online edition of Angewandte Chemie ("Positional Assembly of Enzymes in Polymersome Nanoreactors for Cascade Reactions"). One promising approach to mimicking nature's concept of enzyme assembly and encapsulation has been the use of block-copolymer amphiphiles to construct a closed environment, a so-called polymersome. These polymersomes have most of the properties of natural liposomes but they are larger, and therefore less dynamic, and they have thicker membranes, resulting in reduced permeability. "Until now, in all cases enzyme encapsulation has been obtained without a high level of control over positional assembly" says van Hest. "To mimic nature more closely it would be desirable not only to encapsulate enzymes, but also to position different types of enzymes in separate domains within the polymersome, for example, in the water pool and in the polymersome membrane." With their recent research, the scientists at Radboud University have developed a procedure to do exactly that. What they have achieved,basically, is that they can create well-defined assemblies of enzymes that can communicate with each other. With these assemblies two principles are combined which nature is using for optimal control over synthetic processes, namely protection from environmental influences by compartmentalization, and positional assembly, which brings different catalytic sites in close proximity of each other, without the problem of negative interference. "One specific novelty of our work is the fact that we have succeeded in developing a method to incorporate enzymes in the bilayer of the polymer capsule" says van Hest. "This has given us an additional degree of freedom in positioning enzymes compared to other systems. This method was inspired by techniques first developed for liposomal systems." A second novelty that van Hest points out is the fact that the polymeric capsules that the group developed are porous by nature: small molecules can diffuse freely in and out, whereas large molecules, i.e. enzymes, remain caged and protected. The researchers say that this system can therefore be regarded as a nanoreactor in which catalysis can be performed in a way that combines the advantages of homogeneous and heterogeneous catalysis. Van Hest points out that with their method non-compatible catalytic steps can be made compatible, and labile intermediates can still be used to the short diffusion distances from one catalytic site to the next. "This will increase the possibilities of multistep synthesis and should allow us in the long run to make more efficiently complex molecules" he says. "As a second development, these nanoreactors can also be very useful for diagnostics and therapeutics, due to their protective shell (which can be tailored to certain applications), which protects the capsule contents against e.g. proteases. Of course, as with all leading edge research, plenty of challenges remain before we can expect to see practical applications. "First, we nee to extend the complexity in synthesis, namely the introduction of (organo)metal catalysts besides biocatalysts, and go from a mere proof of concept to a practically appealing system" says van Hest. "Secondly, we have to develop systems that can be active in an in vivo setting, thus going from merely biomimetic capsules to biocompatible structures that can add novel functionality to living systems."